I have finally assembled all my ingredients for hand quilting. My thread arrived the other day – it’s a Valdani Hand Dyed Variegated cotton thread. The colour is called Silver Foam. I really love variegated threads. Why just have one thread colour, when you could have thread colour that changes as you sew? It’s way more fun. Johanna recommended Thread Heaven which is a thread conditioner and protectant. Besides reducing hand fatigue and preventing tangling and fraying, it is acid free and perfect for machine or hand sewing. I have always used beeswax for coating thread and apparently this can have negative effects on both the thread and the piece you’re working on. Thread Heaven sounds dreamy and apparently is awesome for bookbinding, beading and embroidery too. I’ll report back with my review, but I’ve got it in the shop if you’re wanting to try it out yourself! 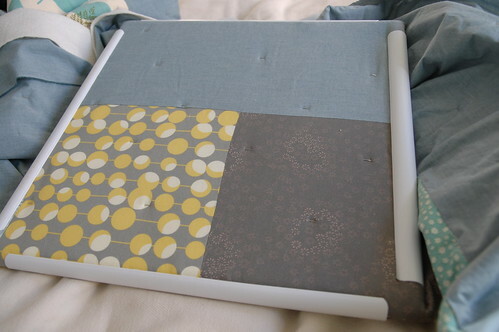 I’m also trying out a Q-Snap frame (17″ x 17″) for the first time. It’s a square frame that is really easy to assemble and won’t give you hoop wrinkles. I really like the square shape, especially since I’m hand quilting straight lines. I’ve also got a leather thimble, but may need to get a metal one instead. As for needles, I plan on trying the little short ‘in-betweens’ and regular needles and see what feels good to me. Considering how much time this part of the project is going to take me, surely I’m going to form some clear opinions to share with you shortly. I’ll take any hand quilting tips that you might want to share with me. I have no idea what I’m doing! I just noticed that this my 101st post. What?! Wow, that kinda snuck up on me. Thread Heaven is great! You can see my little pot of it in this picture, there to the left. I bought it after I kept getting knots in my embroidery floss and it’s been much better. Good luck with the quilting! i am so glad you are working on this. i could really glean some in insight from you with regards to a cathedral window quilt i’m working on. anabela – i actually noticed your little box of thread heaven in that photo a few days ago and it made me feel really good, knowing your were using the ‘heaven’ too. bobbinoggin – oooohh. i really want to learn to do a cathedral window quilt! hopefully i’ll learn something from you too! amanda elizabeth – i’ll be sure to post up my progress and thoughts. i’m a bit nervous, but it’s just sewing! i have a real weakness for juicy colour, so all these threads are completely iresistable. I’m really interested to see how this works out. I’ve only ever machine quilted, with mediocre results. I had one quilt professionally machine quilted, which looks great, but unfortunately I can’t take the credit for it. Once I’m done pieceing the quilt I’m working on now, I’m going to have to get your advice on the sandwiching process (pinning the front and back with the batting) since I haven’t done that in ages.